Heading back home after attending a family wedding in San Diego this weekend and I hope to make it at least to Bakersfield Sunday. There’s a lot of humanity out on the roads today! 1. Refinements to the system that will provide solid opportunities for trades who have restrictions place on their accounts and need to hold for several months rather than just a few days or months. We will notify all members as these come online. 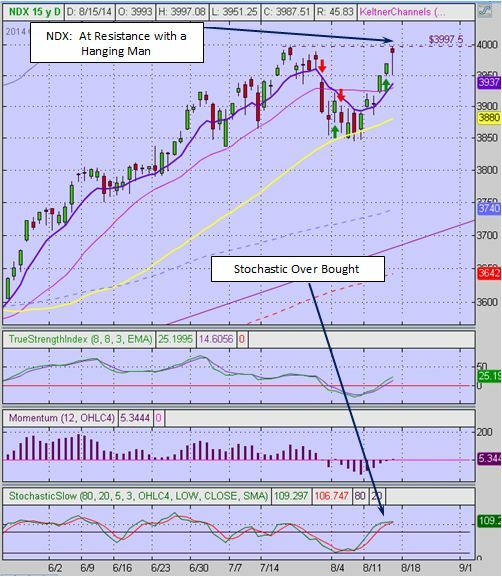 General Market Observation: Each weekend over the past few weeks, it seems that we wind up the week either at support or resistance and then that provides our clue for what the Indexes will do the following week. This week the choice is “at resistance”. Even though the market was designated in a “Confirmed Uptrend” this week it seemed that there were a lot of comments in the Big Picture showing some doubt that this was really going to turn into a strong rebound. Over the past 6 weeks while the Indexes have bounced around with larger than normal ranges on both the daily and weekly charts, there have been some great stocks that have had solid moves. These gains have be in spite of lack of Index conviction. Given where we are in the market, be very aware of where support and resistance are presenting themselves and take at least some profits at well-defined levels. It also appears that the Nasdaq indexes have taken over the leadership from the S&P and Russell. This rotation will show up in the stocks that inhabit both the COMP and the Nasdaq 100. 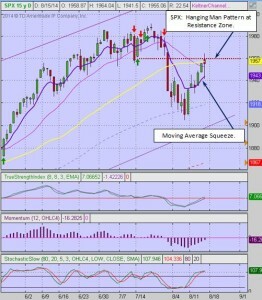 SPX: The S&P finished with a beautiful bearish Hanging Man reversal pattern at resistance of the 50 day moving average. Friday’s news driven dive to the 8 day EMA was short lived and prices rebounded nicely, but still left price below the 50 day SMA. As one can see on the chart below, shorter term traders can plan trades around these moving average bounces, but focus on taking profit as the price action moves back to resistance or support. The price action on the S&P can be used to quick hitting trades in either SPY or UPRO. Currently, price action on the S&P looks more like a traditional moving average squeeze which often leads to a move in the direction the 20 day or 50 day moving averages are sloped. In this case it would be down if taking the clue from the 20 day SMA. Nasdaq: Both of the Nasdaq Indexes had a splendid week, but finished the week at resistance. The question for this week is there enough juice in pre-Labor Day trading by institutions to push through the resistance to new highs? One of the scenarios that could play out is a breakout fake out, where price move above the resistance and then fail! The daily chart below shows the potential set up to the downside. Keep in mind that any move to the downside would be a counter trend trade, so plan to take profit at the 8 or 20 day moving averages. 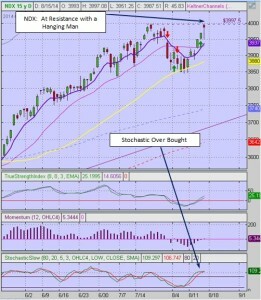 Additionally, the target at the moving averages is not where they are now but where they will be in a day or so! This is fairly easy to estimate by just drawing a line extending the moving average line following its current slope. RUT: The Russell finished off Friday with a big range Bearish Engulfing pattern closing below the 100 & 200 day moving averages but above the upward sloping 8 & 20 day moving averages. All price action for the past three weeks has been taking place below the 50 day. So while prices did move off the strong support zone at 1107 for a tradable rally a retest of this support zone may be in the offing, if a new lower high, is in place. 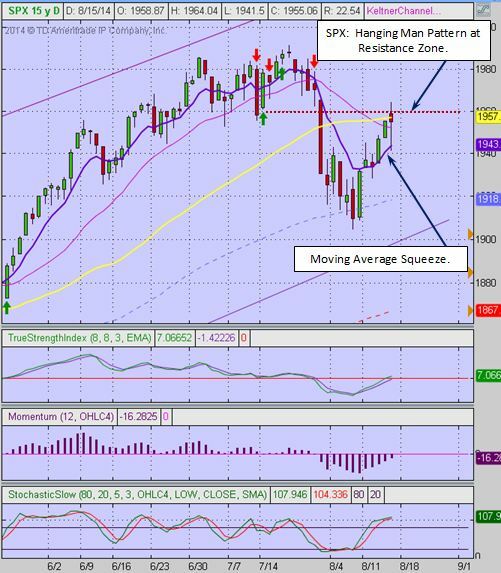 Like the other indexes the RUT appears to be bound between support and resistance and trades in TNA or IWM can be planned around these levels to either the upside or downside. With the gapping nature present in the Indexes of late planning these trades buying at support and selling at resistance and then reverse course appears to be an alternative means of generating weekly and monthly cashflow. These trades may only be in place for less than one day to a couple of days so be ready. For our all Active Trend Trading Members here’s how we utilize our trading capital. Trading Capital Setup and Position Sizing: Every year we start the year off trading a $100K margin account make the math really easy for yearly returns. – The $100K account is split between up to 4 stocks and TNA. Actual number of shares will vary of course depending on price of the entity traded. We have found that limiting open positions to only 5 entities greatly reduces the trade management time requirements for members. This goes back to our goals of providing a system designed for members who work full time. – Regardless of market conditions no more than 50% of available margin is used at any time. – None of the trade setups are a recommendation to trade only notification of planned trades from set ups using the Active Trend Trading System. Each trader is responsible for establishing their own appropriate risk level on every trade. Outs & Ins: AAP makes its yearly debut to the IBD 50 this weekend after a move higher after earning last week. Like many other stocks on the List it is moving up towards the previous high for the year so we will see if price ramps up to this resistance zone. Earnings are almost over for IBD 50 stocks but GLOG reports this week and that may cause some movement. 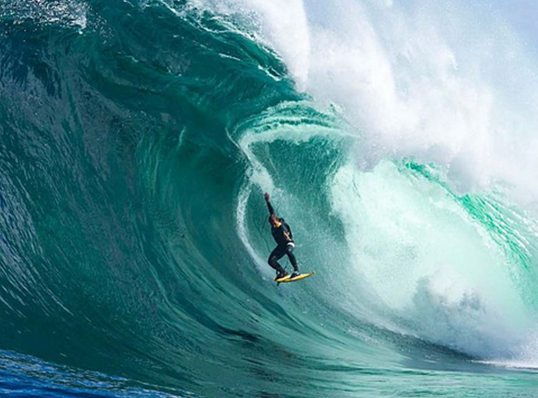 Off the Wall: Patience & Persistence not Perfection! When I say perfection I mean that sense that everything has to turn out just right in order to be successful when trading. The fact is that few things in trading ever turn out perfect! Trading is about observations and adjustments to both get into trades and certainly to get out of trades. We traders must be aware of this constant state of flux and also recognize the limit of our control over the outcome of our trades. This is why the developing the traits of patience and persistence are so critical for traders. These characteristics are what drive us forward with our rules and our routines. After we master our trading system we have a good idea of when and where we need to take action to get into a trade, but we often push the envelope and trade impulsively because we have yet to nurture the traits of patience, persistence and one more—discipline. Traders need to be aware that to cultivate these traits will require focused determination and confidence in the system. Many will start the journey and then get distracted by something that appears to be easier or require less of them. Confidence is developed by using the system either in real trades or simulated trades, again and again until they can stand in the breach and know without a doubt the system will minimize risk and maximize rewards. This wisdom is not something that comes with only a few trades it takes Patience, Persistence and Discipline and often hundreds of trades—simulated or real!